Noseguard Diamond Tip Super Slick by SurfCo. 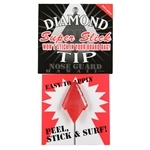 Noseguard Superslick original Diamond Tip - by SurfCo. SurfCo Hawaii is a company committed to surf safety. The nose guard was invented from the need to protect other surfers from the pointy end of all surfboards. In our opinion, it should be on every surfboard. Still.